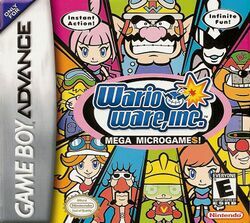 WarioWare, Inc.: Mega Microgame$!, known as WarioWare, Inc.: Minigame Mania in British English and as Made in Wario (メイド イン ワリオ Meido in Wario) in Japanese, is a minigame compilation for the Game Boy Advance and the first title in the critically acclaimed WarioWare series of games. It was released on March 21, 2003 in Japan, later that year in Europe, North America, Australia, and in July 4, 2005 in China. The game has the player play through themed gauntlets of microgames, very short minigames which only last for a few seconds each and whom the player must figure out how to complete through short written instructions and contextual clues. The game's plot centers around Wario who founds a game company and creates a video game along with his friends, an entirely new cast of characters introduced in Mega Microgame$!. The music and sound effects were taken from Wario Land 4. Based on the "Sound Bomber" mode of Mario Artist: Polygon Studio, Mega Microgame$! was a passion project for its development team, who developed it in secret before showing it to their producers. The game was praised by critics for its innovative concept and addictive nature and would become a commercial success despite low internal expectation, selling over one million units worldwide. It was re-released as a free downloadable title for the 3DS on December 2011, only available to people who purchased a 3DS prior to the August 12, 2011 price drop. The game was also released on Wii U Virtual Console in North America, Europe and Australia on April 10, 2014. Wario working in the new WarioWare, Inc. headquarters shortly before calling his friends. One day while lounging on the couch in his house in Diamond City, Wario sees a report from Ken the Reporter on TV about a video game (Pyoro) that has made tons of money. Wario thinks of all of the cash he could get if he made a video game. Quickly, he sits on his bike to obtain a laptop. Wario's house gets replaced with the headquarters of WarioWare, Inc., Wario's newly founded "company." After trying to make a video game by himself, Wario grows lazy and calls up his closest friends to help; they agree. Since Wario does not want to spend too much money on the game, they develop a lot of simple microgames rather than a single full-fledged game. WarioWare, Inc. becomes a commercial success. Wario ends up swindling his employees, though, refusing to pay them and taking all of the money for himself. In the WarioWare, Inc. headquarters, he runs away from his friends with the cash and escapes with a rocket attached to the building. However, Dr. Crygor flying with his jet pack accidentally bumps the rocket and causes it to fall down into the sea along with Wario and the banknotes. The "Gold Digger" microgame, created by Mona. Nose-picking is a recurring microgame theme in the WarioWare series. The game is based around the concept of playing very quick, simple microgames (over 200 in all) in rapid succession. Most games only last about four seconds on the lowest speed. There is a wide range of microgames which vary heavily in style and gameplay. Some feature just black and white stick figures, some games show photographs while the other ones are based on classic video games. A game can just make use of the button, but in the next game the player might use both the and the button to move a character in a platform game. Shortly before a game starts, simple instructions such as "Dodge! ", "Pick!" or "Catch!" are displayed. Each microgame features three difficulty levels, the degree of changes from the lowest to the highest level depends on the game. The game's main part are the microgame stages hosted by Wario and the other characters. After beating a certain number of the microgames in a stage, the speed will increase, and sometimes the difficulty level of the games as well. The microgames appear in a mostly random order. WarioWare, Inc.: Mega Microgame$! includes both modes with a set number of games to finish and arcade-style modes where the player aims for a high score. This concept in a much simpler form with only eight microgames in total was first used in Mario Artist: Polygon Studio in the Sound Bomber mode. Choosing between stages and bonus minigames in Games mode. In-game menus are set up to look like the screen of Wario's laptop. The Games mode can be referred to as the Story mode. There are nine stages hosted by the different characters from the game that come with their own set of microgames based around a certain theme each. Two special stages that are composed of microgames from several previous sets are included as well. Each of the eleven stages must be beaten to progress through the story. All stages feature cutscenes that are centered on the respective character, which are viewed before the actual gameplay. The epilogue of the story shows up after the player beats the stage. To beat a given set, players must beat a certain number of the microgames specific to that set without fail. The last game to beat is the boss stage, a more complex game that lacks a time limit. Players are given four lives at most, losing one for every microgame lost. Losing all lives results in a Game Over. Between every microgame, a short intermission displaying the current score and number of lives shows up, its appearance based on the character's story. Seeing a microgame in the Games mode opens it up for free play in the Grid mode. Dribble and Spitz's intermission in Games mode. It shows the current score and number of lives in form of Spitz dolls in the taxi. After beating a stage, it turns into a challenge to see how long the player can last. The player scores a point after every microgame, even if he or she lost the game when at least one life is left afterwards. In this challenge, the game continues after every boss stage on a higher difficulty level. After beating the boss stage on the third level and every next time, the speed increases additionally instead. By winning a boss stage, the player also gains an extra life if he or she has less than four lives. As a little gimmick, a short break scene featuring the stage's host, which the player can influence by pressing the button, is shown after a boss stage. The stages do not need to be played again to reach the ending sequence, but some extra content is only unlockable by getting a minimum high score on certain stages, and playing every microgame at least one time is required to unlock two of the bonus minigames. By playing the stages, extra challenges can be unlocked. These include special minigames for one or two players, and mixes of the microgames from all sets. They are chosen from the same screen as the microgame stages in Games mode. The single player challenges feature special minigames, several of them being beefed up versions of the microgames. There are also dual-player games which allow for two people to play four simple minigames using only one handheld. The first player uses the button while the second player uses the button. A single bonus minigame can only be unlocked by playing the microgames in the Grid rather than the stages. Finally, there are the tower stages that are the last unlocked stages and challenge the player beating as many of the microgames as possible until he or she has lost all lives. Microgames from all previous stages are put into the mix. For example, one tower challenges players to not miss a single of the hard versions of the microgames. If a microgame has yet to be unlocked, a question mark represents it in the Grid. In this mode, players can play any microgame they have encountered in the Games mode. The Grid allows competitive players to challenge the game. When selected, a single challenge will be fired at the player over and over until they miss four times. Like in the stages, the player scores a point after every microgame. The game goes through a three-microgame difficulty cycle, with the first one being easy, the next being of normal difficulty, and the third being hard. After that, the speed of the game increases and the difficulty cycle begins anew. When getting a minimum score on a game (at most 30 points, depending on the game), the player earns a red flower for this game. The third and last mode the player can choose from is the Options menu. There he or she can view the epilogues of the character stories or delete the current game data, which resets the game to its original state. It is also possible to change name and gender of the player which originally has to be entered before he or she is able to play the game. The gender doesn't affect the gameplay, but some scenes in the character stories and text lines depend on the player's gender. Additionally, the player can change the background music in the name change screen by pressing the button, the three songs available are the background themes of the stages Sci-Fi, Reality, and Nature. Aside from Wario himself, WarioWare, Inc.: Mega Microgame$! introduces a completely new cast of characters. The other main characters are told to be Wario's friends, but it is left unexplained how they met him. Each of them hosts a set of microgames and comes with an individual story dedicated to them. At the end of each story, except for the very first one, the respective character meets with the other ones at the Gelateria. The cutscenes mainly take place in Diamond City, which is first seen in this game as well. The characters were designed by Ko Takeuchi. Wario Being mainly known for treasure hunting and brute strength in the Wario series platformers, Wario has found a "legit way" to make money. He founds his own game company and employs his friends. In the WarioWare series, he is usually seen wearing a biker outfit and often drives around with his Wario Bike. Wario's intense greed makes him refuse paying his friends. Wario does exercises at the WarioWare, Inc. headquarters. He jumps on a trampoline so high that he even goes through the building's chimney. He falls down again right into the boombox next to the trampoline. When he comes out of the boombox's speaker, he is transformed into Tiny Wario. The shark car and potato car known from the microgame "Crazy Cars" come out as well, but Wario avoids them and goes back into the boombox which spits him out again in his true form. He lands on the two cars and flattens them. At first, Wario is seen working in the headquarters again. When getting angry, he throws his laptop high into the air which goes through the chimney and then falls down on Wario. Wario is sucked into the laptop in some way. Like the boombox, it spits Wario out again. At a later point, it turns out that WarioWare, Inc.'s game was a success, but Wario doesn't want to pay his friends. In the headquarters, Wario runs away with the cash and escapes with a rocket, but the escape fails when Dr. Crygor accidentally bumps the rocket which falls into the sea afterwards. Jimmy T. Jimmy Thang, better known as Jimmy T. for short, is a disco dancer wearing a big afro wig. He usually goes to night clubs for dancing, Club Sugar in particular. He is commonly seen with a cell phone and likes to collect ring tones. Jimmy has an affection for cats as well. As usual, Jimmy goes to Club Sugar at night and starts dancing and lets his cell phone play a ring tone. Later, he leaves Club Sugar and listens to another ring tone while strolling through the city. Dribble and Spitz Dribble and Spitz are two anthropomorphic animals who work as cabbies for Diamond Taxi. Dribble is an orange bulldog who usually drives the taxi and is a burly speed freak. Spitz, the yellow cat, is the actual leader and keeps a cool head, unlike Dribble who is not as smart as his partner. They are known for having odd customers and often forget to encash in such cases. Both are big sci-fi fans. At night, Dribble and Spitz are driving with the taxicab through the city and get a customer who is named after the player. His or her's target is the city's harbor. When they arrive at this place, the customer goes out and transforms into a merman or mermaid, respectively. The person jumps into the water and bids farewell. When the person has already disappeared, the amazed cabbies notice that the customer hasn't paid. Mona Mona is a high school student who often works part-time. Her primary employer is Joe. In this game, she works at the Gelateria. The sassy student gets around with her scooter. She frequently has so much work that she just changes from one job to the next during the day. It is implied that Mona is a little smitten with Wario and that she likes money. Mona drives to her workplace, the Gelateria, while her employer Gelato Joe is already there. Since Mona is late, she starts driving very fast. However, the Diamond Police notices her speeding and chases her. Mona calls her three animals for help, the Elephant, the Piggy and the Chimp. They put the police cars out of action, especially her Chimp who turns many cars upside down with his banana peels. Finally, Mona arrives at the Gelateria in the last second. 9-Volt 9-Volt is a gradeschooler attending Diamond City Elementary. He is a big fan of Nintendo and collects everything that comes from this company. The fanboy is always seen wearing a yellow helmet with headphones. Beneath Nintendo items, he enjoys skating with his skateboard SK8 and mixing music with mixing consoles. 9-Volt also has a pet named Shag. The school is out and 9-Volt goes home with his skateboard. At home, 9-Volt's spins records in his room. Next to 9-Volt is an oversized Game Boy and a grabber pops a cartridge into it. Later, Ken the Reporter appears and announces that the Game Boy Advance SP is on sale now. Being excited by this, 9-Volt leaves the house, his skateboard transforms into a hoverboard and the gamer rushes to the next store. Orbulon Orbulon is an alien of unknown origin who once plotted to take over Diamond City's planet which he calls "Earth", but settled down there when his UFO crashed the city. Orbulon has an IQ of 300. His UFO, which is shaped like a pig, acts as Orbulon's primary way of transportation. However, he frequently gets into bad situations with it that result into crash landings. Orbulon heads toward Diamond City's planet with his UFO. Suddenly, a meteoroid flies right into the spaceship and damages it. Orbulon sends a distress call and soon a rescue team of Space Hares appears. They send a container connected with a chain into the UFO which Orbulon's enters. The Space Hares retract the chain, but as soon as Orbulon arrives in the rescue ship, he wants to take over it. The Space Hares waste no time sending the ungrateful alien back to his UFO, which has disentangled itself from the meteor. Spinning out of control, the ship crashes Diamond City, but Orbulon survives. It isn't known if this story is Orbulon's attempted takeover of Earth as mentioned in his backstory. Dr. Crygor Dr. Crygor is a mad scientist who lives in seclusion in his lab on a small island. He wears a cryogenic suit and his body is partly robotic. The genius is convinced about his abilities and does a lot of wacky but mostly harmless experiments. He constructed most of the vehicles and other trademark items of Wario and his friends. For some reason, he is often associated with toilets. The doctor dances around in his laboratory. When he is done dancing, Dr. Crygor reaches for something to drink and grabs a beaker filled with a blue liquid. After drinking it, he suddenly comes down with food poisoning. The mad scientist runs for the restroom and opens the toilet lid. After he has done his business, the toilet literally explodes and floods the lab. While Dr. Crygor tries to swim away, he is sent rocketing into the sky. The odd genius tries to active his jet pack, but it fails and he falls right to the ground. Luckily, Don the Sparrow catches and rescues the quirky man. Kat and Ana Kat and Ana and are kindergarten-aged ninjas and twin sisters. They attend both the Diamond Kindergarten and the Mystical Ninja Elementary. The skilled ninjas mainly fight with swords and shuriken. They love nature and respect every living being. The younger sister Ana is much quieter than the bossy and very adventurous sister Kat. An evil skeleton spirit named Boneheads appears at the Castle. The creature curses the prince or princess who is named after the player and takes over the Castle. Ana and her crew of ninjas attack Boneheads, but they all fail. Ana sends a letter with the help of Don the Sparrow to her sister Kat to call for help, before being captured by Boneheads. Kat, residing with Paw the Dog at a place far away, receives the letter. She and Paw make the long journey to the Castle, where Kat has to fight Boneheads atop the roof. Kat appears to lose at first, but then Paw transforms into a giant sword. With this weapon, Kat manages to destroy Boneheads and saves the prince or princess and Ana. Beneath the main characters, several other characters are seen in the game. Most of them reappear in further installments of the WarioWare series. Note that a number of these characters was renamed in later English releases. Ken the Reporter - An anthropomorphic dog who works for the channel DBS and presents the news and other shows. Pyoro - A small red bird who is the star of the game that inspires Wario to create WarioWare, Inc. He is playable in some minigames in most of the WarioWare titles. Gelato Joe - Another humanoid dog. He owns the Gelateria among other businesses and is Mona's employer. Mona's Elephant - Mona's first animal, it can shoot sludge from its trunk. Mona's Piggy - Mona's second animal, it is able to shoot soccer balls. Mona's Chimp - Mona's third animal and the most effective. It throws banana peels. Diamond Police - Diamond City's local police. They chase Mona because of speeding. Shag - A yellow blocky creature and 9-Volt's pet. He and other members of his species appear in several microgames. Space Hares - Bunny-like dancing aliens that come to help Orbulon. Paw the Dog - One of Kat and Ana's pets, a small dog who can transform into a sword. Don the Sparrow - A large sparrow and also one of the ninja sisters' pets. It carries Ana's letter to Kat. Ana's Crew - A group of five ninjas who try to defeat Boneheads. Boneheads - An evil skeleton spirit who causes trouble at the Castle. There are nine different sets of microgames, each one created by one or two WarioWare developers and focused on a certain theme. Intro Games Wario Basic games that all involve Wario in some way. Only has 12 normal microgames. Sports Jimmy Every game features a certain sport each, such as baseball and tennis. Sci-Fi Dribble and Spitz The games are focused on science fiction elements such as aliens, space fights, and superheroes, but also ninjas. Strange Mona Mostly everyday things such as nose-picking and sawing are shown in a strange way. Nintendo Classics 9-Volt All games are based on classic Nintendo games and toys, such as Super Mario Bros. and the Ultra Hand. IQ Orbulon These games last twice the time and require more thinking than the other ones. Includes counting and finding an object on the screen. Reality Dr. Crygor The games feature partly animated photographs, for example photos of people and animals. Nature Kat and Ana Animals or plants such as frogs and flowers are involved in all games. Anything Goes Wario Wario appears in some way in all of the games. Otherwise, there is no specific theme that would apply to all games. Note: The menus of WarioWare, Inc.: Mega Microgame$! mention the Intro Games stage as a "Introduction" stage and not as Wario's (first) stage. Also, the menu mentions only Dribble as developer of Sci-Fi games and only Kat as developer of nature games, while Spitz and Ana clearly are developers as well. Besides the single sets, there are also six extra microgame stages involving the microgames from more than one character. Two of them are Remixes of Jimmy T. that act much like the regular stages and need to be beaten to unlock three or one new character stage(s), respectively. The other ones are hosted at four different towers located in Diamond City, all featuring pig sculptures. The intermission between the microgames in the tower stages looks like a reverse-colored child's drawing of the inside of an elevator with an animated pig head on the doors. Jimmy's Remix No. 1 Beating the stages of Dribble, Mona, and 9-Volt A mix of the microgames of Jimmy and the aforementioned characters. However, Jimmy's boss stage, "Punch Out" (which will start at level 2), is the only boss stage to appear. The games start on the middle difficulty level. Jimmy's Remix No. 2 Beating the stages of Orbulon, Dr. Crygor, and Kat A mix of the microgames of the aforementioned characters. Again, only Jimmy's boss stage is featured (which is always on the hardest level), and the games start on the middle difficulty level. Easy Beating Wario's second stage The microgames of all characters on the lowest difficulty level randomly appear, except for the boss stages, meaning that no extra lives can be earned. The speed is normal and never goes faster. Total Boss Beating Wario's second stage Only the boss stages appear in this stage in a constant order. They are also played at a high speed. After beating Wario's Adventure, it starts at the first again, and the level will increase like in normal microgame stages. If the player fails a boss microgame, they must redo that microgame again until they pass it. Extra lives can't be earned. Thrilling Scoring 15 or more points in Easy The speed is normal and never goes faster. However, all games are on the third difficulty level, and only one life is available, meaning that the game is over after only one lost microgame. Boss microgames are not involved. Hard Scoring 15 or more points in Thrilling All microgames are set at the lowest level, and no boss microgames appear, but all microgames are played at a high speed. Besides the microgames, also "full" minigames without a strict time limit can be unlocked. They are mostly beefed up versions of the microgames. Some of these games also involve other WarioWare developers than Wario, in the microgames only Wario is featured in his own games. There are also slightly altered altered ports of past Nintendo games. In these games, the player aims for the high score which will be saved. Jump Forever Beating Jimmy's stage. Wario has to jump a rope. Its speed and position changes during the game. Jump Forever ends the first time Wario's body touches the rope. If the player should reach 100 jumps, they will have the option of being able to change the BGM when starting a new game. Skating Board Beating Jimmy's Remix No. 1 stage. 9-Volt has to avoid obstacles and birds with his skateboard by jumping and ducking. The game ends with one miss. Paper Plane Beating Jimmy's Remix No. 2 stage. The player has to move a gliding down paper plane through a tower without touching any obstacles. Dr. Wario Scoring 20 or more points in Jimmy's stage. The Viruses have to be eradicated by putting the Megavitamin segments of the same color in line with them. Speed and difficulty are variable. Slightly altered port of the NES game Dr. Mario. Fly Swatter Scoring 25 or more points in Jimmy's Remix 1 stage. In each level, the player has to hit all insects and avoid their attacks, then Watinga appears as the last enemy. Slightly altered port of the minigame Gnat Attack from the SNES game Mario Paint, but the player moves with the D-pad rather than the Mouse. Sheriff Scoring 25 or more points in Jimmy's Remix 2 stage. A beauty has been kidnapped by bandits. The sheriff has to rescue her by shooting all bandits in each level. Slightly altered port of the arcade game Sheriff. Pyoro Unlocking all games in the Grid. The small bird Pyoro has to catch the falling vegetables with his long tongue. The higher away the vegetables are, the more points they are worth. When a vegetable hits Pyoro, the game is over. Pyoro 2 Earning a flower in all games in the Grid. Similar to the previous game, but Pyoro spits seeds this time that destroy the vegetables. The player scores more points when two or more vegetables are hit at one time. Again, the game ends as soon as Pyoro is hit by a vegetable. In all of these games, one player has to press the button while the other one has to press the button. Unlike the single-player games, there are no high scores, a game just ends after one player has earned the necessary points and won. VS Chiritorie Beating either Dribble & Spitz's, Mona's or 9-Volt's stage. The players move vacuum cleaners and have to pick up as much trash as possible. Based on the toy Chiritorie released by Nintendo in 1979. VS Chicken Race Beating one more of the stages named above. Based on the game of Chicken. 9-Volt (P1) and Shag (P2) have to get as close to the edge as possible, but must not exceed it. VS Dong Dong Beating either Orbulon's, Dr. Crygor's or Kat & Ana's stage. Both characters, Mona (P1) and Dribble (P2), have their own side. The target is to push one of the yellow blocks with the up and down moving bar to the other side to squash the opponent. VS Hurdle Beating one more of the stages named above. Orbulon (P1) and Dr. Crygor (P2) take part in a hurdle race where they have to jump hurdles and to run on mud. Diamond City, the main place of the WarioWare series, features several locations in this game that are mostly connected to one character or character pair each. Almost all of these places reappear in further installments. The following list includes the objects mostly seen in the character-related cutscenes. Objects only seen in the microgames are not listed. WarioWare, Inc.: Mega Microgame$! was developed by Nintendo R&D1 and first announced in early 2003. It was directed by Hirofumi Matsuoka and produced by Takehiro Izushi. Other key developers include Goro Abe, Ko Takeuchi and Kazuyoshi Osawa. The "Jump" game in Mario Artist: Polygon Studio on which the microgame "Crazy Cars" is based. The WarioWare concept with very short minigames coming one after another was first used in Mario Artist: Polygon Studio, a game released for the Nintendo 64DD in 2000 only in Japan. The game's so-called Sound Bomber mode includes eight microgames, six of the microgames in WarioWare, Inc.: Mega Microgame$! are based on those. Made in Wario, as the game is known in Japan, was originally made secretly by a number of developers on the development team Nintendo R&D1 without telling their manager at the time. The people came up with the idea of using Wario for the game since they couldn't think of anyone else who would be best for the game. According to them, Wario is "always doing stupid things" and is "really idotic", so they used him and the other newly created characters, who have become a recurring cast in the series. Being convinced by their work, the makers presented their idea to their manager at a certain point. He didn't seem to be surprised and just gave his okay, so the people continued the development. Concept art of several WarioWare characters at a board. For the creation of the microgames, each person on the team came up with their own ideas, which were wrote down on notes and attached to the director's table. After this, the people went through the ideas to decide which ones could be included in the final product. 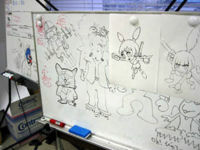 Since the game became well-known around the department, even people who weren't on the project started to submit their own ideas. Because each of the programmers created their own graphics during the development of the games, the art style is very different with each microgame. Shigeru Miyamoto put a lot of thought into how best to market the game. He wanted to show how its unusual playing style made it distinct from other games, in the way it could be simply picked up and enjoyed. Miyamoto gave the staff the approval to use the slogan "More! Shorter! Faster!" (最多 最短 最速), which prominently appeared on the Japanese box art, surpassing the actual game logo in terms of size. It wasn't used for the later Western packages which depicted Wario and his friends rather than just a portion of Wario's face as seen on the Japanese counterpart. The original box art of Made in Wario, sharing its simple style with all subsequent Japanese covers. Made in Wario or WarioWare, as the franchise is called in the West, was first announced by Nintendo in early January 2003 and originally released in March 2003 in Japan. Nintendo didn't have hugely high commercial hopes for the game. However, the game's sales figures were growing and growing and it gained a very good reputation. Since WarioWare, Inc.: Mega Microgame$! was commercially successful, Satoru Iwata, president of Nintendo, requested a remake of the original WarioWare, Inc. for the Nintendo GameCube that had to be finished "as soon as possible." The development resulted in the first sequel, WarioWare, Inc.: Mega Party Game$!, which focuses on multiplayer and came out in Japan only a half a year later after the first game. It is also the first WarioWare game that was co-developed by Intelligent Systems. More WarioWare sequels have followed since, which mostly make use of a new piece of Nintendo's hardware, and so WarioWare has become one of Nintendo's headliner titles whenever they bring out new hardware. Overall, the critic's reviews were positive. GameRankings' overall score for the game is 89%. WarioWare, Inc. also won numerous awards. The Japanese Famitsu magazine rated the game a score of 35 out of 40. 1UP.com's Shane Bettenhausen rated the game 9.5/10 and enjoyed how fast-paced and frantic the game was. He also stated that playing the games was all it took to convince his friends of the game's value. Bettenhausen enjoyed the weirdness of the game, too. Jeff Gerstmannf of GameSpot stated that the combination of minigames and pacing of puzzle games such as Tetris came together in a wonderful way. He rated the game a score of 9.1/10. IGN's Craig Harris loved WarioWare and awarded it a score of 9/10. He stated that it did not matter that the main quest only took one or two hours. The additional replay value made up for it. He also cited the game's "pick up and play" qualities as reasons for his high score. Game Boy Advance Benjamin Turner, Gamespy 91/100 "My first few hours with WarioWare were extremely fun, as I couldn't get enough of the game's distinct brand of inspired insanity. Once that initial novelty started to wear off, however, I lost a bit of the enjoyment. The core gameplay is still plenty strong, though, and I fully expect to be enjoying WarioWare for the foreseeable future. WarioWare, Inc.: Mega Microgame$ is the ultimate game for the attention span impaired; Luckily, it's a lot of fun for everyone else too. It's great to see such a bold, original product from the Nintendo of 2003; If it could just turn this into a trend, it'd go a long way toward restoring lost luster to Kyoto's number one video game company." Game Boy Advance Tom Bramwell, Eurogamer 9/10 "Unlike a lot of GBA games, Wario Ware overcomes its potential brevity with a meaty selection of bonus games, and offers so much in one package that it's always going to happily occupy that slot should you feel like slipping the GBA into your pocket as you slide out the door. It may contradict the relaxing weather we're enjoying at the moment, but we'd happily sweat our way through a T-shirt drawer if it meant the difference between sunburn and playing Wario Ware. If variety is the spice of life, then Wario Ware is the digital equivalent of Phall curry, burning the inside of your face [it'll be more than your face that's burning after a Phall! - rueful Ed] with its charm and originality, and deservedly severing a few crisp bank notes from your wallet in the process - even if it does still plunder the crevices of yesteryear for a lot of its gaming content. Buy it or we'll smack ya." Game Boy Advance Jeff Gerstmann, GameSpot 9.1/10 "While it can be said that the game isn't quite as exciting once you've seen every minigame it has to offer, the method that it brings the games to you stays fresh, and a bevy of unlockables--including full versions of Dr. Mario (renamed Dr. Wario here) and Nintendo's classic arcade game Sheriff--keep things moving along quite nicely. In the end, the game does have a lot of that Tetris-like appeal, making it something that you can play in short bursts and return to again and again, which is one of the most admirable qualities a portable game can have. Anyone looking for an exciting change of pace will have a fantastic time with WarioWare." The game was awarded the Editor's Choice Award at both GameSpot and IGN. At the Edinburgh International Games Festival in 2004, WarioWare took the Edge Award and was named the most innovative game of the year. Furthermore, WarioWare, Inc. gained one of the three Innovation awards at the 4th annual Game Developers Choice Awards in 2004. In 2008, Game Informer named the game one of the top ten weirdest of all time. WarioWare, Inc.: Mega Microgame$! was entirely developed by Nintendo R&D1, while future installments would be co-developed with Intelligent Systems. The game was directed by Hirofumi Matsuoka, who previously directed Wario Land 4 and Mario Artist Polygon Studio, whose "Sound Bomber" mode was a direct inspiration for WarioWare. WarioWare was Matsuoka's last work at Nintendo, as he would depart the company to join Creatures, Inc. shortly after the completion of the game. For this subject's image gallery, see Gallery:WarioWare, Inc.: Mega Microgame$!. It has been suggested that audio and/or video file(s) related to this section be uploaded. Please upload all related music, sound effects, voice clips, or any videos for this section. See the help page for information on how to get started. Help:Media • Having trouble playing? Wario Land 4 • WarioWare, Inc.: Mega Microgame$! • WarioWare: Twisted! Classic NES Series: Donkey Kong • Classic NES Series: Dr. Mario • Classic NES Series: Super Mario Bros. This page was last edited on April 16, 2019, at 19:24.